The U.S. Navy began replacing and upgrading its ultra-high frequency (UHF) satellite communications network during the 1990s with a constellation of customized satellites built by Hughes Space and Communications Company. Known as the UFO (Ultra High Frequency Follow On) series, these HS-601 model satellites support the Navy's global communications network, serving ships at sea and a variety of other U.S. military fixed and mobile terminals. They are compatible with ground- and sea-based terminals already in service. The UHF Follow-On satellites replace the Fleet Satellite Communications (FLTSATCOM) and the Hughes-built Leasat spacecraft. In July 1988, the company won the competition for a fixed-price contract awarded by the Program Executive Office for Space, Communications, and Sensors in Washington, D.C. The initial agreement called for the company to build and launch one satellite, with options for nine more. Options for spacecraft 2 and 3 were exercised in May 1990; for 4, 5, and 6 in November 1990; and for 7, 8, and 9 in November 1991. The UFO spacecraft has proven to be a very flexible platform for the evolution of critical advanced DOD communications services. The satellites are versions of the body-stabilized, three-axis HS-601 model. The spacecraft was introduced in 1987 to meet anticipated requirements for high-power, multiple-payload satellites for such applications as UFO, direct television broadcasting to very small terminals, private business networks, and mobile communications. The HS-601 satellite comprises two main modules. The bus module houses the bus electronics, propulsion subsystem, and battery packs. The payload module contains the communications equipment and antennas. The UFO satellites are manufactured in El Segundo, California. Using a building-block approach, Boeing and the Navy enhanced the constellation's capabilities in stages. Satellites F-1 through F-3 carry UHF and SHF (super-high frequency) payloads to provide mobile communications and fleet broadcast services. Starting with F-4, an additional EHF (extremely high frequency) payload was added to provide protected communications. F-7 introduced an enhancement to the EHF package that essentially doubles capacity. The UFO satellites offer increased communications channel capacity over the same frequency spectrum used by previous systems. Each spacecraft has 11 solid-state UHF amplifiers and 39 UHF channels with a total 555 kHz bandwidth. The UHF payload comprises 21 narrowband channels at 5 kHz each and 17 relay channels at 25 kHz. In comparison, FLTSATCOM offers 22 channels. 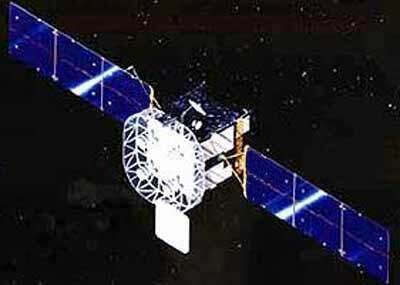 The F-1 through F-7 spacecraft include an SHF subsystem, which provides command and ranging capabilities when the satellite is on station as well as the secure uplink for Fleet Broadcast service, which is downlinked at UHF. The Navy added an extremely high frequency communications package beginning with the fourth spacecraft. This addition includes 11 EHF channels distributed between an earth coverage beam and a steerable 5° spot beam and is compatible with Milstar ground terminals. The EHF subsystem provides enhanced antijam telemetry, command, broadcast, and fleet interconnectivity communications, using advanced signal processing techniques. The EHF Fleet Broadcast capability supersedes the need for the SHF fleet uplink. Beginning with UFO F-7, the EHF package was enhanced to provide 20 channels through the use of advanced digital integrated circuit technology. The first seven satellites and F-11 measure more than 60 feet long from the tip of one three-panel solar array wing to the tip of the other. The arrays are folded against the spacecraft bus for launch, forming a cube roughly 11 feet per side. The satellites weigh an average of 2,600 pounds with the UHF payload, 3,000 pounds with the additional EHF payload, and 3,400 pounds with the GBS payload. The Atlas rocket series was chosen to provide the launches from Cape Canaveral, Fla. The Atlas-2 was chosen for F-4 through F-7.